Below you can find recent questions regarding tensioned membrane structures, inflatable buildings, party halls, portable hangars, party tents and their rent from your potential customers. To publish your Question please register and go to the "Publishing" page, the question should be submitted to Questions and Answers category. Below you can find recent inquiries regarding tensioned membrane structures, inflatable buildings, party halls, portable hangars, party tents and their rent from your potential customers. To receive instant updates you are welcome to subscribe to FStructures.com marketplace RSS feed. Tensile structures are widely used as a means of protection against the weather in publicly used spaces. This is because such buildings can span large distances and are esthetically pleasing. 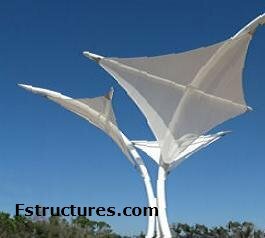 Tensile structure is a construction of elements carrying only tension and no compression or bending. Tensile structures are generally supported by some form of compression or bending elements for example the masts in The O2, known as the Millennium Dome. Building place - Wayne Twp.